We determined the concentrations of 98 halogenated organic compounds and synthetic musks in breast fat tissues of 50 breast cancer patients (age range: 34–77 years) collected during 1996–1998 in Ulster County, New York, USA. 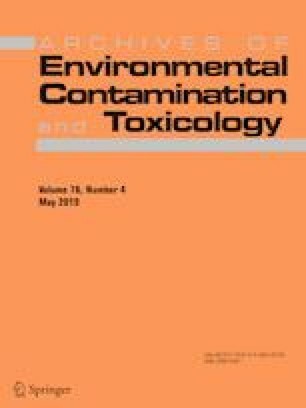 Polychlorinated biphenyls (PCBs), organochlorine pesticides (OCPs), polybrominated biphenyl 153 (PBB-153), polybrominated diphenyl ethers (PBDEs), and synthetic musk compounds (SMCs) were analyzed in breast fat tissues, and 46 analytes were found at a detection frequency of ≥ 65% and at concentrations in the decreasing order of OCPs > PCBs > SMCs > PBDEs > PBB-153. PCBs (median: 323 ng/g wet wt) and dichlorodiphenyltrichloroethanes (DDTs, median: 293 ng/g wet wt) were the major compounds found in breast fat tissues. Among PCB congeners, hexa- and hepta-chlorobiphenyls (60% of total PCBs) were the abundant ones. p,p′-DDE accounted for more than 99% of the total DDT concentrations. The concentrations of SMCs and PBDEs were 1–2 orders of magnitude lower than those of PCBs and DDTs. 1,3,4,6,7,8-Hexahydro-4,6,6,7,8,8-hexamethylcyclopenta-r-2-benzopyran (median: 33 ng/g wet wt) was the most abundant SMC, whereas BDE-47 (median: 4.5 ng/g wet wt) was the most dominant PBDE congener present in breast tissues. A significant correlation (p < 0.05) between women’s age and concentrations of DDTs, chlordanes, hexachlorobenzene and PCBs in breast tissues was found. Concentrations of PCBs, PBDEs, OCPs, and SMCs were not significantly different between malignant and benign tumor cases. This study adds baseline information on target tissue burdens of persistent organic contaminants in breast cancer patients. The online version of this article ( https://doi.org/10.1007/s00244-019-00621-0) contains supplementary material, which is available to authorized users. The authors acknowledge the support of the Benedictine Health Foundation, Kingston, New York, without whom this study would have been impossible. We thank Dr. Robert Jansing (Wadsworth Center) who facilitated the transfer of breast fat samples from Benedictine Hospital in Kingston to Wadsworth Center for analysis.